Biography*: Alexander Fraser of Touchfraser and Cowie (died 11 August 1332) was a member of the Scottish nobility who served as the Lord Chamberlain of Scotland and also as the Sheriff of Stirling. He was a descendant of the Clan Fraser members deriving from Oliver Castle. He married Mary Bruce, daughter of Sir Robert de Brus, 6th Lord of Annandale; Mary Bruce died in the year 1323. Alexander died at the Battle of Dupplin Moor nine years later. Biography*: Alexander Seton, Lord Gordon († 1440–1), Scottish baron, Lord of Parliament and progenitor of the Gordon Earls and Marquesses of Huntly. Alexander Seton was the second son of Sir William Seton of Seton and his wife, Janet Fleming. When King Robert III of Scotland sent his only remaining son, the future king James I of Scotland to France for safety, the ship was taken by English pirates and Prince James, along with his companions, was taken prisoner and turned over to Henry IV of England. Alexander Seton was one of those taken prisoner along with the future king. On 7 March 1408 Alexander's father, Sir William Seton, purchased the wardship of Elizabeth Gordon, Heiress of Gordon from Walter de Haliburton of Dirleton for a liferent of 50 merks from the barony of Tranent. Sir William originally betrothed her to his eldest son Sir John Seton but when John declined, Elizabeth was then betrothed to William's younger son, Alexander Seton, who by this time had been released by the English. Elizabeth and Alexander wed in 1408. He acquired through his marriage to Elizabeth Gordon the lands of Gordon and Huntly, confirmed to them on 20 July 1408. This was according to custom of the time that Elizabeth Gordon, of her own free will, resigned her lands before Parliament at Perth and she and the Regent Albany issued a new charter of "All and whole of the lands and baronies of Gordon and Huntly lying within the sheriffdom of Berwick; the lands of Fogo and Faunes with their pertinents; the lands of Strathbogie and Beldygordon with the pertinents in Aberdeenshire; to be held by the said Alexander and Elizabeth and their heirs lawfully procreated; whom failing the true and lawful heirs of the said Elizabeth whomsoever; rendering the services used and wont." Three years later Alexander fought at the Battle of Harlaw and was knighted before 1419. In 1421–2 he traveled to France and visited King James of Scotland. Alexander Seton was one of those who negotiated for the release of the Scottish monarch and was a hostage for his king, but was released after a year in England to return to his family in Scotland. In that same year Alexander and Elizabeth were granted a charter for half the lands of Culclarochy and part of Gerry in the barony of Drumblade. About 1436 Alexander was created a Lord of Parliament as Alexander Seton, Lord Gordon. In 1428 Alexander and Elizabeth were granted a dispensation from the pope long after their marriage when it was determined they were within the forbidden degrees of consanguinity; the dispensation stating that Alexander Seton had contracted marriage with Elizabeth, the heiress of Gordon, "per verba de presenti publici, juxta morem patriae" (Latin: publicly in accordance with all customs of the time). Elizabeth predeceased her husband dying at Strathbogie on 16 March 1439 while Alexander died in 1440–41. 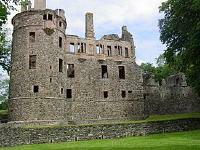 Biography*: Sir Adam de Gordon, Lord of Gordon (died 1402) was a 14th-century Scottish baron. He was son and heir of Sir John de Gordon, knight, Lord of Gordon, and his wife Elizabeth Cruickshanks. When George I, Earl of March defected to England Sir Adam Gordon was given the superiority of his lands of Gordon and Fogo, raising him to the baronage, and at the same time made warden of the east marches. Gordon was also in the division of the Scottish army which, under the young James Douglas, Earl of Douglas, invaded Northumberland in 1388, ending with the battle of Otterburn on 19 August, where Douglas with many other Scottish noblemen was killed. On 18 June the same year King Robert II of Scotland granted him a charter confirming to him and to his heirs the lands of Strathbogie given to Sir Adam de Gordon by King Robert de Bruce. Gordon was included in the grand army with which, in 1402, Archibald Douglas the Earl of Douglas invaded England. Though watched by Henry Percy, the Earl of Northumberland and his son Hotspur, the Scots penetrated without hindrance to the gates of Newcastle. They had reached Wooler on their homeward journey when the approach of an English army forced them to take up a position upon Homildon Hill. They became impatient under the discharge of the English arrows. Sir John de Swynton, with whom Gordon had been at feud, called impatiently for a charge. Gordon fell on his knees, begged Swynton's forgiveness, and was knighted on the spot by his reconciled enemy. They charged the English at the head of a hundred horsemen, and inflicted much slaughter, but were overpowered and slain. John Gordon, succeeded his father but died before 7 March 1407–8 without issue. Biography*: Marie de Coucy (c. 1218 – 1285) was the daughter of Enguerrand III, Lord of Coucy and his third wife Marie de Montmirel (c. 1184–1267). She was Queen consort of the Kingdom of Scotland and a descendant of Louis VI of France. On 15 May 1239 she married King Alexander II of Scotland in Roxburgh. She brought a large train of French followers to Scotland. Two years later, she gave birth to the future King, Alexander III of Scotland. The marriage brought an alliance between the Scots and the Coucy lordship, and for the rest of the 13th century, they exchanged soldiers and money. Her husband died in 1249 and Marie made sure her son was crowned as soon as possible at Scone. Two years later she returned to Picardy, although she would frequently revisit the Kingdom of Scotland. She also visited Canterbury on pilgrimage in 1275–76. Her second husband was Jean de Brienne, Grand Butler of France, whom she married sometime before 1257. She was his second wife. They had no children together; however, de Brienne had a daughter Blanche by his first wife Jeanne, Dame de Chateaudun. [S746] Wikipedia, online http://Wikipedia.com, http://en.wikipedia.org/wiki/Enguerrand_III,_Lord_of_Coucy. Biography*: Ermengarde de Beaumont (c. 1170 – 11 February 1233/1234) was Queen of Scotland as the wife of King William I. She is reported to have exerted influence over the affairs of state as queen, though the information of her is lacking in detail. Ermengarde was born c. 1170 to Richard I (fr), Viscount of Beaumont-le-Vicomte, Fresnay and Ste-Suzanne (died aft. 1199, bur. Etival), and wife (m. bef. 1177) Lucie de l'Aigle (fr) (died aft. 1217), daughter of Richard II de l'Aigle. Her father was the son of Roscelin, Viscount of Beaumont (fr) (died ca. 1176) and wife (m. 1122) Constance or Maud FitzRoy, illegitimate daughter of King Henry I of England. She married William I of Scotland at the royal chapel at Woodstock Palace near Oxford in England on 5 September 1186 by Baldwin, Archbishop of Canterbury. The marriage was arranged by King Henry of England, who was at the time the acknowledged overlord of Scotland: William considered her status beneath him, but agreed after Henry offered to pay for the entire wedding, land valued at 100 merks and 40 knight’s fees, and to return the castles that he had forfeited, one of them being Edinburgh. The chronicler Walter Bower described Ermengarde as ‘an extraordinary woman, gifted with a charming and witty eloquence’. Though William had many lovers before his marriage, he was reportedly never unfaithful to her after their wedding. The relatives of Ermengarde benefited from her status as Queen. In 1212, she accompanied William with their children to King John of England to secure the succession of their son Alexander. Queen Ermengarde is credited with mediating a renegotiation of the 1209 treaty, probably due to her husband’s incapacity. Due to the illness of William, Ermengarde took over some of his duties during his later years, and there is evidence that she wielded considerable influence in public affairs. She is recorded to have presided with the Bishop of St. Andrews over a complex court case. In 1207, there was a complaint by a canon that a royal chaplain obtained the bishopric of Glasgow by bribing the King and the Queen. Ermengarde was described as distraught and lethargic over her husband’s death in 1214. As Queen Dowager, she devoted her time to the foundation of a Cistercian abbey at Balmerino in Fife. It was completed in 1229, and she often visited it as a guest with her son Alexander. She stayed at the abbey many times. Margaret of Scotland (1193–1259). Married Hubert de Burgh, 1st Earl of Kent. Isabella of Scotland (1195–1253). Married Roger Bigod, 4th Earl of Norfolk. Marjorie of Scotland (1200–1244). Married Gilbert Marshal, 4th Earl of Pembroke. Biography*: Enguerrand III, Lord of Coucy (c.1182–1242) was the eldest son and successor of Ralph I, Lord of Coucy. He succeeded as Lord of Coucy (sieur de Couci) in 1191, and held it until his death; he was also lord of Marle and Boves. Enguerrand III was born at the Château de Coucy. He became one of the most ambitious and powerful of all the French nobles, called by one historian "the greatest baron in all Picardy", and earning himself his epithet, Enguerrand le Grand, or Enguerrand "the Great". Enguerrand had an illustrious military career, helping the King of the French Philip Augustus reduce the French territories of the King of England. Enguerrand campaigned in Anjou in 1205, and in 1214 fought in the French victory over an Anglo-German alliance at the Battle of Bouvines. His arms at Bouvines were blazoned: Barry of six vair and gules. He was a notable member of the French force which invaded the Kingdom of England (1216–1217) to depose King John. He also participated in the Albigensian Crusade. Je suis ni roi, ni prince aussi: Je suis le seigneur de Coucy! Neither king nor prince am I: I am the Lord of Coucy! Through his mother Alice de Dreux, Enguerrand III was related to King Louis IX of France. Enguerrand also married into the family of King Henry III of England, taking as his second wife the latter king's cousin, the granddaughter of Henry II of England. He married three times. His first wife was Beatrix de Vignory, widow of John I, Count of Roucy. They married in 1201. There are no known children from this marriage. His second wife was Matilda (or Richenza) of Saxony (1172–1208/09), the aforementioned granddaughter of Henry II, Duke of Saxony and niece of Richard the Lion-hearted. This marriage took place in 1204. There are no known children. Enguerrand IV, Lord of Coucy. Married 1) Margaret of Gueldres, daughter of Otto II, Count of Guelders and 2) Joan of Flanders, daughter of Robert III, Count of Flanders. Alix de Coucy, married Arnold III, Count of Guines. Their son, Enguerrand V inherited the title after his uncles. [S746] Wikipedia, online http://Wikipedia.com, http://en.wikipedia.org/wiki/Ralph_I,_Lord_of_Coucy. Biography*: Ralph of Coucy, (c. 1134 – † 1191), lord of Coucy, lord of Marle, La Fère, Crécy (sur-Serre), Vervins, Pinon, Landouzy (la-Ville), and Fontaine (lès-Vervins). He was the son of Enguerrand II, Lord of Coucy. He left for the Holy Land, where he died in the siege of Acre in November 1191. Coucy, finding himself a widower and desiring a male child, married for the second time with Alix II of Dreux, a royal princess who was a relative by his mother, Agnès de Beaugency, daughter of Mahaut (or Maud or Matilda) de Vermandois, eldest daughter of Hugh I, Count of Vermandois called the Great, brother of King Philip I of France. Alix II of Dreux was the daughter of Robert I, Count of Dreux, grandson of King Philip I, and King Louis VII of France's niece. Alix de Dreux II's mother was Agnès de Baudement, Countess of Braine, third wife of her father Robert I de Dreux, and her brother was Robert II, Count of Dreux (d. December 28, 1218), Count of Dreux and Braine, who was married to Yolande de Coucy, eldest daughter of our Raoul, and Agnès of Hainaut, his first wife. By his two marriages, Raoul became stepfather to a great prince, son-in-law to a son of France, and cousin to Philip Augustus. Raoul attended the King of France in 1181 during the war against Philip I, Count of Flanders, although previously he had received the land of Marle and Vervins in the fief of La Ferte-Beliard that the Count had given him as an homage. But by the peace treaty granted afterward the king ordered that the Count should take this tribute back. The same Raoul became liege of the king for the estates of the fief of La Fère, which had been previously held by the church of Laon. [S746] Wikipedia, online http://Wikipedia.com, http://en.wikipedia.org/wiki/Enguerrand_II,_Lord_of_Coucy. Biography*: Enguerrand II, Lord of Coucy, known as of La Fère or of Marle, was a French nobleman. He was also lord of Marle, La Fère, Crécy (sur-Serre), Vervins, Pinon, Landouzy (la-Ville), Fontaine (lès-Vervins), and of several other places. Unlike his father, the brigand-lord Thomas de Marle, Enguerrand II peacefully administered his lands, building a chapel in his castle (the chapel's foundations survive as some of the oldest remains in Coucy). In 1131, he married Agnès de Beaugency, first cousin of king Louis VII of France, and daughter of Mahaut or Mathilde de Vermandois, herself a daughter of Hugh I of Vermandois, brother of king Philip I of France. Agnès gave him two sons, Raoul I, Lord of Coucy and Enguerrand. Biography*: Thomas of Marle, Lord of Coucy and Boves, was born in 1073 to Enguerrand I of Boves, the Lord of Coucy and his wife Adele of Marle. After the death of his father, Enguerrand I, Thomas would become the Lord of Coucy and his family's other holdings. As the most well-known of the Lords of Coucy, Thomas of Marle would become infamous for his aggressive and brutal tactics in war and his continued rebellion against the authority of Louis VI. The new Lords of Coucy that Thomas was descended from had not been landed nobles in the area for very long. In 1035, the first lord of Coucy, Dreux, Seigneur de Boves, seized the Castle of Coucy from Alberic, its original owner, and established himself as Lord of Coucy. This move seems to have set the tone for the behavior of the following Lords of Coucy, including his grandson Thomas who would become infamous for his ruthlessness in war. In 1073, Thomas of Marle was born as the heir of Enguerrand I of Boves, the Lord of Coucy, and his wife the Dame of Marle, Adele. Enguerrand was known as a womanizer but his faults were overlooked by chroniclers due to his continued support of various religious institutions in the area. Although he supported the Catholic Church, Enguerrand I and the previous lords of Coucy were known to participate in a number of local wars in order to gain land and resources. As the first born heir, Thomas would have been educated in the affairs of nobility which would have included the skills and virtues of a knight. As a knight, he was expected to uphold certain chivalric virtues that were used to control knightly and noble violence and disorder. Chivalry was nurtured in France and was used to influence and control the behavior of knights and nobility. It was used as a sustaining ethos of warrior groups who were identified on one hand by their martial skill as horsemen and by a combination of pride in ancestry, status, and traditions of service. Three themes are woven into the fabric of the ideals of knighthood: religious, social, and martial service to their lord. In Thomas' lifetime, the social status of knights and nobles in France was becoming parellel which culminated in the structured world of knighted nobility in the thirteenth century. Through this shift in the status of knights, the code of chivalry was becoming the basis for society's expectations of knightly behavior. When Thomas began his own military campaigns, it was for his continued abuse of knightly virtues and expected behaviors that he would be remembered. Thomas and his father grew to become bitter rivals after Thomas' paternity was cast into doubt and his father openly toyed with the notion that Thomas was not his true son. It is possible that because of this uncertainty with whom his father truly was, Thomas would become more associated with the surname of his mother (Marle) instead of his father. Nevertheless, Thomas participated in the numerous private wars that were launched against his father and helped defend his father’s wealth and land. These private battles were fought primarily by household knights and taught Thomas how to use pillaging and destruction as a helpful tool for taking over new territories and crippling his enemies. After the famous summons to crusade by Pope Urban II in 1095, Thomas and his father Enguerrand rode out with members of their house to participate in the First Crusade. According to familial legend, while they were travelling with a small party of their household Enguerrand and Thomas were set upon by a band of Muslim warriors. Moving quickly, the men of Coucy shredded their cloaks trimmed with squirrel fur (vair) into six pieces to use as banners for recognition and managed to defeat their attackers. The sources are unclear on whether it was Thomas or Enguerrand who created the makeshift banners but this event was commemorated permanently in their coat-of-arms which shows "barry of six, vair and gules". Both Thomas and his father returned safely from the First Crusade to their holdings in France. By right of marriage, Thomas came into possession of the fortified castle of Montaigu in the district of Laon which he would use as a base for his early military movements. Because of the strength in his holdings, he was a threatening presence in the area to his neighbors who were unhappy with his growing confidence and ambition. According to Suger, Enguerrand was an honorable man and made more effort than anyone to drive Thomas from his castle ‘because of his seditious tyranny.’ With Enguerrand's support, several barons attempted to enclose Thomas into his castle with a palisade and starve him into submission. Luckily for Thomas, he was able to slip away and assembled a host of seven hundred knights to retake the area. The barons learned of this oncoming force and begged Thomas to spare them the shame of lifting their siege and facing their lord-designate. They retreated and Thomas quickly destroyed the palisade and reinforced the castle of Montaigu which angered the retreating magnates. The barons threatened on oath to honor him no longer and, when they saw him leaving with his army, they followed him as though they would engage in combat. The two forces were prevented from battle by a roaring stream that separated them. Eventually the men of the highest nobility, including Enguerrand, came together for deliberation. Deciding to consider Thomas' youth and valor, they chose to defer to him and pledge their allegiance to his cause. Not long after this, Thomas of Marle lost both the castle of Montaigu and his marriage caused by an annulment due to an incestuous relationship. In 1116, he succeeded his father, Enguerrand I, as Lord of Coucy and added the lands of his mother to their domains. Following the tradition of his forefathers, Thomas of Marle began waging multiple private wars against his neighbors to expand his holdings. Thomas of Marle came into power during a period of unrest with the nobility of France. Abbot Suger of St. Denis' chronicles of the reign of Louis VI "the Fat" recorded his king constantly marching across his kingdom to bring his unruly lords and barons to heel. Each of these feudal lords were described as violent and disloyal to feudo-vassalic oaths and therefore were the epitome of brutality that would typify this period. As king of France, Louis had taken "vows to put down with his strong right arm insolent tyrants whensoever he sees them vex the state with endless wars, rejoice in rapine, oppress the poor, destroy the churches, give themselves over to lawlessness which, and it be not checked, would flame out into ever greater madness." As far as Suger and his king were concerned, Thomas of Marle was the worst kind of warmonger and represented a threat to France's people, church, and lands. While Louis VI had been busy waging war against his enemies in England and his nobility within his kingdom, Thomas of Marle took advantage of the distraction and began waging war in the lands of Laon, Rheims, and Amiens, devouring them "like a raging wolf." As he laid waste to the countryside of France, he shocked the Roman Catholic Church leaders when he seized the abbey of the nuns of St. John of Laon. Knights like Thomas of Marle were encouraged to avoid attacking or capturing Catholic churches in war due to their inhabitants being unable to defend themselves or bear arms. The Peace of God and Truce of God movement promised severe punishments, including excommunication, to any knight or noble who broke this spiritual law. European sovereigns like Louis VI recognized the need of presenting their own organizations and conduct as chivalrous which required an emphasis on the Christian vocation of knighthood. Thomas of Marle had openly ignored these spiritual laws when he initiated this attack and did not spare the members of the clergy from the violence. As the medieval period progressed, especially during the Crusades, the chivalric code became more closely tied to the spiritual elements of the Catholic Church. A number of orders of knighthood became obsessed with crusading and had a number of statutes that outlined the religious observances that their knights must observe. As a knight, Thomas of Marle should have been an example of virtues like wisdom, charity and loyalty, and honor above all while eschewing pride, idleness, false-swearing, lechery, and especially treason. Instead, Thomas became the example of every bad behavior a knight could be accused of. The Abbot Guibert of Nogent, Sous, and Coucy added to the growing rumors of Thomas' atrocities by describing a struggle between the Lord of Coucy and an archbishop. After the archbishop was murdered, Thomas sheltered the murderers and protected them within the walls of his castle. Guibert described Thomas as a man who attained power by praying on the weak, the young, and pilgrims on their way to Jeruselem. He described how Thomas captured prisoners and forced them to endure vicious tortures in order to receive ransoms from them. "For when he was compelling prisoners to ransom themselves, he hung them up by their testicles, sometimes with his own hands, and those often breaking away through the weight of the body, there followed at the once the breaking out of their vital parts." Guibert described Thomas as an savage brute who was responsible for countless atrocities and attacks on the innocent. His sins caused the people of the entire region to adopt his bad behavior as well making him a threat to the peace of France. By abandoning the chivalric virtues of mercy, loyalty, spirituality, and honor, Thomas became the antithesis of the medieval model for knighthood. Scandalized by this knightly lord’s behavior, the Church of France met in a general synod at Beauvais and passed a sentence of condemnation upon their new enemy of the Church—Thomas of Marle. Cono, the bishop of Praeneste and papal legate to the holy Roman Church, led the council in their decision to punish Thomas of Marle to the extent of their spiritual ability. Using the spiritual powers given to the church through the sword of the apostle Peter, they condemned Thomas of Marle to be punished with general anathema or excommunication. Cono and the council of French religious officials also removed the sword belt of knighthood from him, although Thomas was not present, and declared him to be infamous, a scoundrel who was unworthy of the name Christian. Thomas of Marle's behavior on the battlefield and his brutal treatment of prisoners garnered him the attention of many of France's leaders. As a Christian monarch, Louis VI was persuaded by the results of the general synod and gathered an army to march against Thomas of Marle quickly. He was able to quickly take the well-fortified castle of Crecy which his followers took to be a sign of God's favor on their mission. Louis VI's army cut down a number of Thomas of Marle's men without mercy and set fire to the castle. After his victory at Crecy, Louis VI pressed his advantage and continued his march to the castle of Nogent. An anonymous man came to Louis VI as he approached and told the king that the castle was overrun with wicked and unfaithful men. More shocking was his story of the fate of the commune of Laon—the man claimed that Thomas' men had burned it, and several other holy places, to the ground when they burned the rest of the city. He claimed that nearly all of the noble men of the city had "suffered martyrdom because they were true to their faith and defended their lord the bishop." These faithless men had even gone so far as to put the Bishop Gaudin to death and left his naked body on the open road so that it would fed on by the beasts. All of this, according to the man, had been orchestrated by Thomas of Marle in order to attack and hold this tower. Furiously Louis VI attacked the castle of Nogent, releasing all of the subjects in prison and punishing the followers of Thomas. He commanded that any disloyal man he came upon would be fastened to a gibbet and left as food "for the greed of kites, crows, and vultures." Once Louis VI had taken these two castles, he returned the domains of the monastery of St. John and continued his campaign against disloyal knights and lords. To ensure that Thomas of Marle would gain nothing from his violent and faithless attacks, Louis decreed that none of the heirs of Thomas would ever hold lordship over these cities. Louis VI continued to press his advantage against Thomas by leading a host of men directly to the center of Thomas' power at Coucy. This action was spurred on by a number of bishops and notable men of France, most prominently the distinguished Count Ralph of Vermandois. Encouraged by his religious fervor and the revenge he wished to bestow on behalf of the church, Louis VI ignored reports of ambushes and the strength of Thomas' holdings in Coucy. On their way to the castle, Count Ralph moved ahead with a number of knights and came upon a small skirmish with Thomas of Marle present. Thomas had already been knocked from his mount and Count Ralph saw his opportunity. Moving quickly, Count Ralph struck Thomas with his sword and dealt him a mortal wound. Mortally wounded and taken captive, Thomas was brought before King Louis VI who commanded that he be returned to Laon. The next day, Louis confiscated Thomas' estates and tore down the enclosures he had built in preparation for war before returning to Laon to deal with his disloyal vassal. Regardless of threats or force, Thomas refused to free the merchants that he had been holding captive despite their rite of safe conduct. Louis VI gave Thomas' wife, Melisende of Crecy, permission to come to her husband’s bedside but Thomas seemed more upset about the loss of the merchants than his approaching demise. The wounds he had received in his final battle pained him greatly but he was still reluctant to make his final confession and receive the viaticum. When he finally conceded, Suger claims that the Lord himself did not want him to receive the holy sacrament. Just as Thomas raised his neck to speak to the priest, it twisted back and broke on the spot. Thus, bereft of the Eucharist, Thomas of Marle breathed his last in the year 1130. After his death, Louis VI released all of Thomas' prisoners and relieved his wife and sons of a great portion of their wealth before returning to Paris. Thomas’ first born son, Enguerrand II, became the next Lord of Coucy and their remaining lands. When Thomas returned home from the Crusades and he married his first wife Ida of Hainaut, the daughter of Baldwin II, Count of Hainaut, in 1102 at the age of 29. Beatrix de Coucy married Evrard III de Breteuil, son of Valeran II Sire de Breteuil. Enguerrand II Lord of Coucy and Marle. Robert Lord of Boves (died at Acre in 1191) married Beatrix de Saint-Pol, daughter of Hugo II, count of Saint-Pol and his second wife Marguerite de Clermont. Melisende de Coucy, was contracted to marry Adelme, Châtelain d'Amiens, son of Adam, Châtelain d´Amiens. She married before 1162–73 (date of charter) Hugh de Gournay, seigneur of Gournay-en-Brie, son and heir of Gerard de Gournay, seigneur of Gournay-en-Brie, by his wife, Ediva, daughter of William de Warenne, 1st Earl of Surrey.